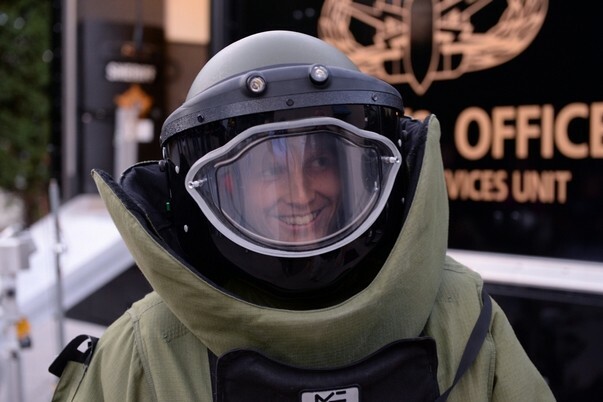 I’l admit, strapping on the bomb suit put me in a Hollywoodesque mindset.I imagined I was starring in the Oscar-nominated The Hurt Locker as I approached the scene of a controlled explosive to ensure the blast detonated. Strips and pieces of cardboard were everywhere. A small blast mark had imprinted in the parking lot space. All clear. The Spartanburg County Sheriff’s Office put me front and center of a blast demonstration during its recent Citizens Police Academy. In case you missing it, I’ve signed up for another citizens academy, this time through the sheriff’s office to see how the city and county law enforcement agencies differ. The city police agency does not have its own bomb squad, so there’s one clear difference. This 80-pound suit will withstand an explosion of 20 psi if more than six feet away. Even at that distance, you’ll still feel a beating. But you’ll survive, they told me. The bomb squad, a five-member team responding to the call part-time, handle about 70 scenes per year in this almost 300,000 county. Photojournalist Tim Kimzey shot some great photos of this experience. You can see the photo gallery and full review of the suit and bomb squad at GoUpstate.com.